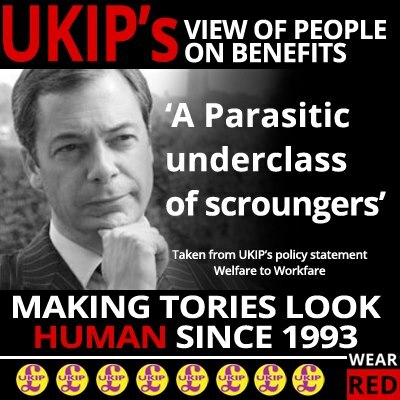 In 2013 UKIP described the unemployed as a “a parasitic underclass of scroungers”. UKIP’s welfare policies include forced unpaid work for all Housing and Council Tax Benefit claimants, Incapacity Benefit (now ESA) slashed to Job Seeker’s Allowance rates and childcare support for working parents demolished. • Non means-tested “basic cash benefit” for low earners and unemployed. Jobseekers allowance and incapacity benefit is scrapped. • Child benefit for the first three children only. • No benefits for anyone who has not lived in the UK for five years. • Enrol unemployed welfare claimants onto community schemes or retraining workfare programmes. • Make welfare a safety net for the needy, not a bed for the lazy. Benefits only available to those who have lived here for over 5 years. That is, yet more scapegoating of the out-of-work – and ‘foreigners’. 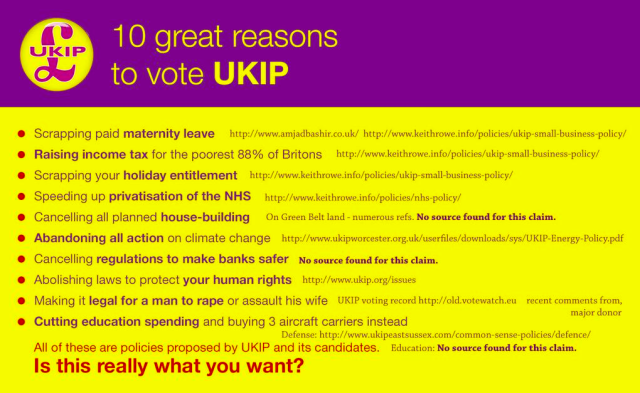 I wonder if UKIP’s policies or even the 3rd Reichs policies will/would differ? This will make for an interesting court case. From other socially responsible people who shall remain valued. What a wonderful night! I cried all through the second set,( not easy when full of cold) sent me straight back to the strike. Seemed very fitting for the 30th (Yes 30th) anniversary of this event. Thanks to Julia and Sue for a wonderful present, even though it was not my birthday.